The development of heterogenization of copper nanoparticles on conductive supports is very challenging and has received much attention. 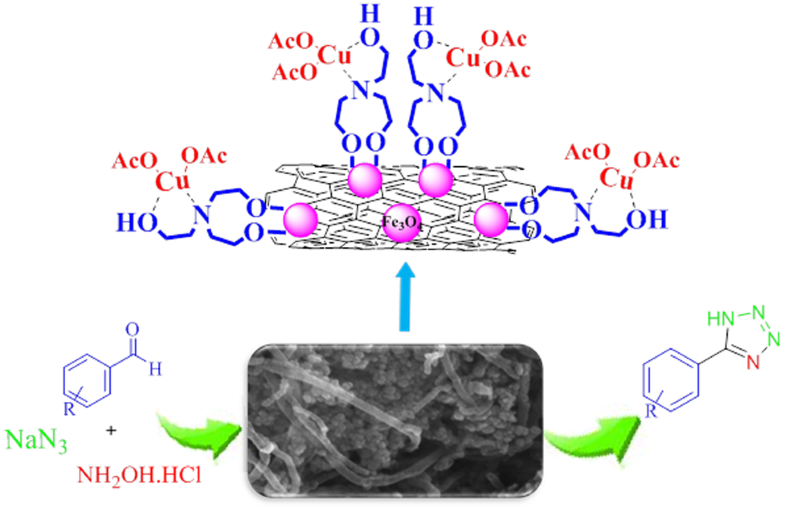 Here, we synthesize a practical, efficient, and inexpensive heterogeneous catalyst to grow stable metallic copper(II) nanoparticles on the surface of magnetic carbon nanotube (Fe3O4–CNT) catalyst support physically functionalized with triethanolamine (TEA) that acts as a low-cost and non-toxic ligand to capture the copper nanoparticles [Fe3O4–CNT–TEA–Cu(II)]. The as-prepared heterogeneous catalyst was characterized by different techniques, such as Fourier transform infrared spectroscopy, energy-dispersive X-ray spectroscopy, thermogravimetric analysis, vibrating sample magnetometer, X-ray diffraction patterns, field-emission scanning electron microscopy, and atomic absorption spectroscopy analysis. The catalytic behavior of Fe3O4–CNT–TEA–Cu(II) was investigated in the preparation of 5-substituted 1H-tetrazole derivatives via one-pot, three-component reaction between aromatic aldehydes, hydroxylamine, and sodium azide. The low catalyst loading, wide substrate scope, use of inexpensive materials, simple separation of the catalyst from the reaction mixture by an external magnet, short reaction times, easy workup, affordability, and superb yield are some advantages of this protocol. 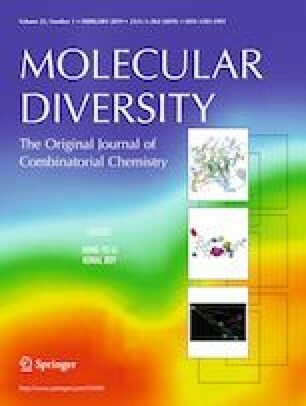 The online version of this article ( https://doi.org/10.1007/s11030-019-09951-6) contains supplementary material, which is available to authorized users. The authors gratefully acknowledge the Semnan University Research Council for the financial support of this work.